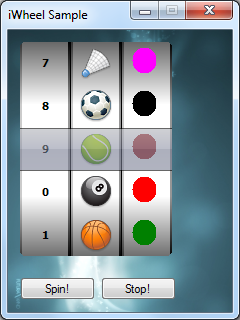 iWheel is a .NET Framework GUI control which allows the user to choose items from lists by rotating a cylinder. 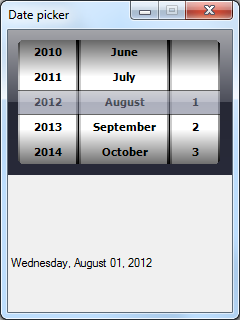 The items of the list are spread over the surface of the cylinder and behave much like iPad’s date picker. iWheel provides a total flexibility for the developer by allowing him to choose the amount of cylinders. He can also decide to display text, images or even an owner-drawn list of items. The cylinders are drawn in a stylish way using attractive visual effects such as shadows and gradient-fills. Let your customer touch the cylinder with your finger or by mouse and spin it to choose a desired item.